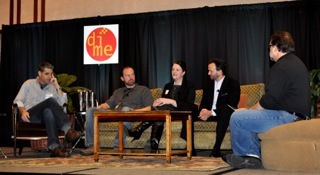 The DiMe has started out with a groundbreaking line up of new media pioneers. 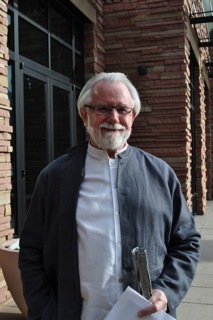 Dr. Alvy Ray Smith, two-time Academy Award Winner and co-founder of Pixar received the first lifetime achievement award. As he notes, “we’ve reached convergence and it’s amazing.” He is originally from Las Cruces, New Mexico where, according to his mom, he could hear the first A-bomb being tested and where test rockets were fired into the hills above the town. He translated Moore’s law into a more intuitive graph beginning at 1x and postulating that we are now at 1 billion x.
Ben Long spoke of “Music and Sound in Interactive Media.” He traces the history from video game Pong which had only 3 beeps through the arcade era with the “wall of chaotic sound”, to the birth of the home interactive entertainment where people demanded better graphics and sound. He mentioned how far behind mobile sound was in video games as compared to the rapid developments in graphics. The smartphone has changed all that offering an extensive toolset that one would have as a film composer. Carla Johnson’s company, EarthvisionZ, takes up where Google Earth leaves off. As she said, “The planet is the most powerful platform.” She notes how 3D is our natural way of seeing the world and processing information. We have to train ourselves to understand a 2D map. For this reason information and data in 3D speeds up cognition. This is Web 3.0, interacting in a geospatial way. She touched on mind-boggling, applications that layer vertically on Google Earth that can be personalized. The Digitools of the Trade Roundtable was full of interesting discussion. Melissa Harrigan of Pixorial noted that we are moving away from search and toward discovery. We are trusting our social networks help us discover content. As she’s learned from her kids, “the right content must always be available”. Don Hahn asked how TV fits in and if we will be moving to a one-screen environment. Harris Morris felt that we will have multiple devices and that we will have the right screens for the right project. Some things will be best viewed on the big screen, others on the smartphone, others on a tablet.